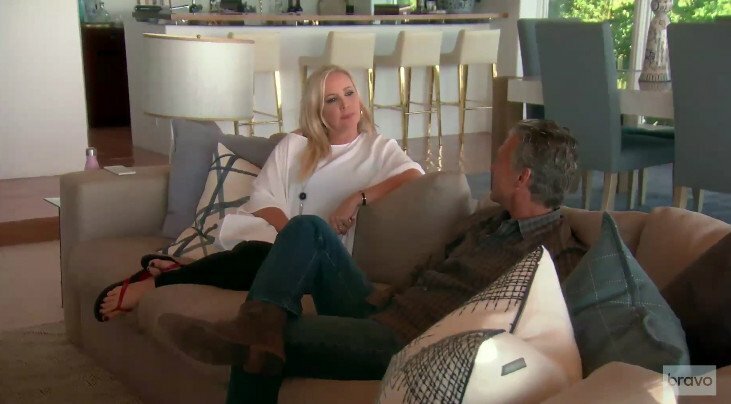 Shannon Beador is weighing in on last night’s birthday celebrations overload on The Real Housewives of Orange County. She shares her thoughts on Vicki Gunvalson‘s birthday party, her own birthday festivities and the awful rumors about Eddie Judge shared during Vicki’s bash. Bravo Announces Real Housewives of Orange County To Return February 7! Confirms New Housewife! The Bravo network just announced moments ago that the Real Housewives of Orange County season 7 will premiere on February 7! Heather and husband Terry Dubrow have four kids together: twins Nicholas and Maximillia, 8, Katarina, 5, and Collette, 10 months. Despite her husband’s profession, Heather boasts in her Bravo bio that she has “never had plastic surgery” other than Botox and filler. Not quite sure we’re buying that! PHOTOS – ALEXIS BELLINO GETS A NOSE JOB! As for what we can expect this season, Vicki, still in the process of divorcing Donn, puts her house up for sale and introduces the wives to Brooks Ayers, her new Southern boyfriend. While finalizing her divorce from her ex-husband, Simon Barney, Tamra begins to take her relationship with boyfriend Eddie Judge to the next level. VICKI GUNVALSON’S DAUGHTER BRIANA ELOPES IN LAS VEGAS! Meanwhile, Gretchen begins a daring new chapter in her life when she takes to the stage as a singer and dancer with the Pussycat Dolls, as her relationship with Slade becomes strained due to his past issues with Vicki and Tamra. Alexis has no storyline “continues to test the boundaries of independence with her husband Jim when she gets a job as a correspondent with a local morning news show” and struggles with being a working mom. The press release also states that longtime foes Tamra and Gretchen finally decide to bury the hatchet and begin a blossoming friendship, leaving Alexis fearing that she is losing Gretchen — a.k.a. her only ally on the show. RHOC returns to Bravo on Tuesday, February 7 (9/8c). Below is a video interview with new housewife Heather! TELL US – EXCITED ABOUT THE NEW SEASON? THOUGHTS ON THE STORYLINES? Gretchen Rossi is talking the upcoming season of Real Housewives of OC, specifically new Housewife Heather Dubrow. It sounds like Heather was in for a wild ride of Housewives hazing before settling in and being accepted into the cast full of catty over-grown mean girls. Speaking to Us Magazine, Gretchen reveals “we were pretty hard on her.” Although Gretchen is not revealing who that “her” is, because Bravo has yet to confirm that Heather, who has been spotted filming several times with the cast and was mentioned by Vicki Gunvalson in a recent interview, is the newest Housewife! “At first I didn’t like her, but now I really like her,” Gretchen explains. In other RHOC news, Gretchen and her boyfriend, fiancé, leased object, partner – whatever – Slade Smiley hosted a cancer benefit this past week and the OC Register was on hand to cover the event. The event, Magic of Giving, was hosted in honor Slade’s son Grayson Smiley, who is battling a rare form of brain cancer and has undergone seven brain surgeries. Slade has credited much of his financial difficulty to providing treatment for his son’s care, for which as you can imagine, bills are exorbitant. The $50 a head gala, held at Victor Paul Salon raised money for the Beckstrand Cancer Foundation, which assists cancer families experiencing financial difficulty by helping to pay medical bills. The evening featured a magic show by famous illusionist Anthony “the Magic” Hernandez and was attended by several other celebrities, including Project Runway’s Michael Costello. The entire OC cast was in attendance (including Heather), as Bravo was filming the evening for the upcoming season! Vicki, who attended the event with boyfriend Brooks Ayers, was happy to be included. And singing a different tune she had nothing but empathy for Slade’s situation! Hmmm… is it because she now knows from experience? “We’re all either stricken or know somebody that has been stricken with cancer. My heart goes out to Slade,” Vicki sympathized. Her own daughter Briana Wolfsmith (who eloped this week) has undergone tests for cancerous tissues. “I’m very thrilled people that people are willing to give up their time to support something like this,” Slade announced. “Everyone’s affected in some way.” As for his take on the upcoming season 7 of RHOC, which is currently filming, Slade promises big changes! THOUGHTS ON GRETCHEN’S COMMENTS ABOUT HEATHER? THOUGHTS ON THE MAGIC OF GIVING EVENT; SURPSIED THAT THE ENTIRE CAST ATTENDED? ARE YOU EXCITED ABOUT THE UPCOMING SEASON OF REAL HOUSEWIVES OF ORANGE COUNTY? Photos have been removed at the request of the owner. Peggy Tanous will not appear on the upcoming season of the Real Housewives of Orange County. Vicki Gunvalson revealed the surprising news over the weekend during the Bravo Housewives tour in Atlantic City as she confirmed filming had indeed began on the seventh season of the Bravo hit show. Wowzers! This also confirms what we’d been hearing which is that Alexis Bellino will be returning for the new season. Apparently Bravo had a change of heart. TELL US – THOUGHTS ON PEGGY’S DEPARTURE? WILL YOU MISS HER ON THE SHOW? Following last week’s drama filled premiere, episode two of the Real Housewives of Orange County is coming our way tonight at 10/9c on Bravo. On the new episode titled “Shameless In Seattle,” after being with Slade for a year and half, Gretchen still doesn’t know if she is ready for marriage again. Tamra opens up about her emotional divorce to pal Fernanda, while Alexis spends the morning at the park with her close friend Peggy and their daughters. The women have been friends through their pregnancies, but now that their kids are getting older, they find themselves becoming more competitive. And Vicki heads to Seattle for her annual insurance conference, leaving Donn alone, yet again. Meanwhile, newbie Peggy Tanous opens up about her life and discusses joining the show in a new interview with the Daily Pilot. Peggy, 42, mother to two daughters – Capri and London – is a former model and public speaker. Peggy reveals ever since she was a little girl, she told her mom she wanted to be the next Marilyn Monroe. So what can we expect from Peggy this season? She reveals while most of her day to day is “boring,” she did share a very sensitive part of her life – – her battle with post-partum depression. The series will show her going through a healing process. Watch What Happens Live – The guests tonight will be Gretchen Rossi and boyfriend Slade Smiley. According to Andy Cohen, previously scheduled guest Sean Avery, of the New York Rangers, had to cancel. TELL US – WHAT ARE YOUR THOUGHTS ON PEGGY’S INTERVIEW, THE PREVIEW & TONIGHT’S NEW EPISODE? They’re officially back! The Real Housewives of Orange County, aka the first blondes ladies of Bravo housewives, return tonight for their sixth season. Meanwhile, it seems new “housewife” Fernanda Rocha, 34, might be getting the Jennifer Gilbert treatment this season. Who is Jennifer Gilbert you ask? Well, Jennifer was cast to be a housewife on the Real Housewives of NYC last season, only to get the shaft during the season, by being demoted to an extra. Fernanda, who is openly bisexual, is noticeably absent from the official cast photo above, though she does appear in another one. Watch What Happens Live – OC Housewives Tamra Barney and Vicki Gunvalson will be joining Andy Cohen in the Bravo clubhouse tonight. TELL US – WHAT ARE YOUR THOUGHTS ON THE OC HOUSEWIVES PREVIEW & PREMIERE?